I spite of its tiny size, the Epstein-Barr virus is a formidable enemy that zaps your energy. I’ve been fighting it since last December. 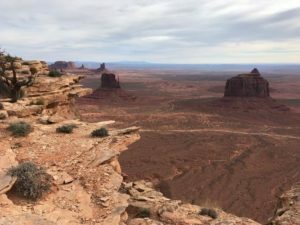 By early February, I was able to start running again, but in March, with the Monument Valley 50 just days away, I realized the evil virus had robbed me of my running confidence. Could I still run 50 miles? I had no idea. I had signed up for the race when I was healthy, when I logged between 70 and 80 miles most weeks, sometimes more. For the last three months, my mileage had lingered around 45, counting lots of walking miles. It only crept above 70 a week before the race, which made my taper very short. 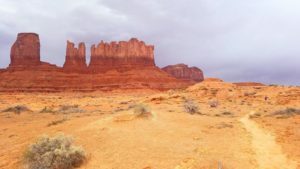 In spite of my suboptimal training, I wanted to run Monument Valley because it is my favorite race on this planet, hands down. There was no way I would miss it, but I had not pushed myself beyond a very easy pace since last year. I had not pinned on a bib since October. 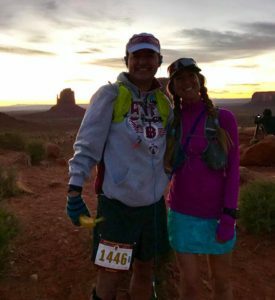 Because I felt unfit, apprehensive, and unsure of what the day would bring, I briefly considered joining my husband David in the 50k, but then decided to run the 50 miler, rather than racing it. My plan was to take it easy, to listen to my body, and to just enjoy a day of being immersed in so much breathtaking scenery. On race morning, runners shiver from a mixture of cold and anticipation. 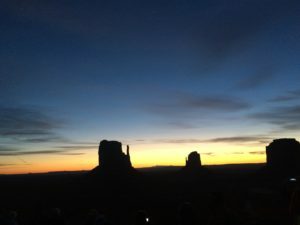 We greet the dawn with a Navajo prayer, just one of the many special touches making this race a unique experience that transcends pure competition. The sun peeks out over East and West Mitten when we take off. True to my race plan, and also because David and I and our friend Quang were so busy taking pictures of the spectacular sunrise that we almost missed the 50-mile start, I file into the back of the pack, happily trotting down the Wildcat trail behind other runners who do not seem to be in a big hurry. The forecast has promised interesting weather: overcast skies, wind, a good chance of thunderstorms later in the day. In other words, anything is possible, from PR conditions to a repeat of the 2014 inaugural Monument Valley, which took place in a sand storm. A rain jacket and a head lamp are waiting in my drop bag at Three sisters, the Grand Central Aid Station. I hope to not need either, but like a good girl scout, I’ve brought everything I might use, except for the heart rate monitor that guided my recovery training. I want to enjoy the day, to run as fast and as far as I can. I don’t want to worry about data. A few miles in, my legs remember what to do. 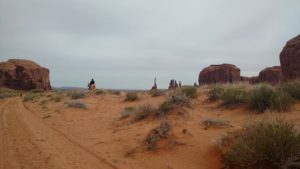 They settle into a steady pace across the sandy ground, allowing me to take in the desert scenery: deep washes, silhouettes of mesas and giant rocks in the distance, sagebrush, a few gnarled juniper bushes – a picture of serene perfection I never get tired of. We reach the picturesque Three Sisters aid station, next to a hogan and some horse corrals. 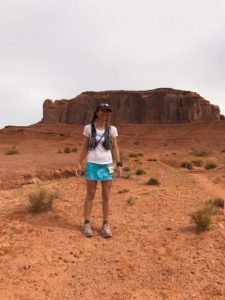 The Monument Valley Ultra course is like a cloverleaf: different sections keep looping back to this hub, which makes it a crew and family friendly race. 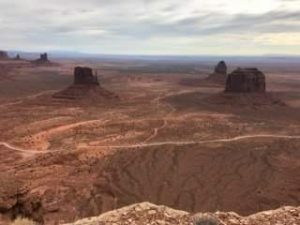 The view from Mitchell Mesa. 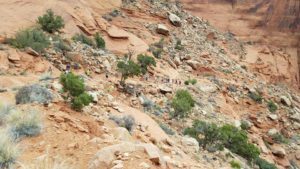 Last year, the climb up Mitchell Mesa was the final part of the 50-mile course. Saving the best for last also meant that the back-of-the-packers climbed up there in the dark and did not get to enjoy the spectacular views. This year, we’re scrambling up there early in the day, on fresher legs. It’s a short climb, but a steep and technical one. It’s also an out and back section, which means that, in addition to soaking up the glorious vistas, I can see how many 50-mile runners are ahead of me: two, free, four, five . . . I think I’m in seventh place. Not too shabby. My competitive instinct, in deep hibernation since last December, finally begins to stir. Back at Three Sisters,the Swedish Fish look more appealing than healthier options, so I grab a handful of these gummy treats before heading out on the green loop, aka a ten-mile sightseeing tour of iconic arches: the Big Hogan, the Ear of the Wind. The Big Hogan, a special place worth the short detour. An overcast sky keeps the desert from heating up, and I am moving at a decent pace, passing a few other women, without bothering to check whether they’re 50k or 50 mile runners. My competitive instinct yawns and stretches, but slumbers on. I take extra time to step in to the Big Hogan, to look up at the sky, to take pictures of horses looking at runners. I take time to savor each Swedish Fish, to feel my feet sink into the sand with each step. I feel like the luckiest human alive. I also feel strong again, for the first time since December. Three Sisters comes back into view around mile 25, the half way point. I’m happy I didn’t switch to the 50k, happy to not be almost done. Time to refill my pack, time to grab more Swedish FIsh, time to head back out. A woman with a blonde pony tail next to me is wearing a 50-mile number. My competitive instinct is waking up with a sudden jolt, eyes wide, nostrils flaring. Halfway there. Photo courtesy of David Silva. A familiar voice calls my name: it’s David, passing through Three Sisters for the final time on the 50k course. A brief hug, a photo. The blond ponytail charges ahead, bouncing up the hill at breakneck pace. I wave a quick good-bye to my husband, then charge after it in hot pursuit, my fidgeting, excited competitive instinct egging me on. I’m definitely racing now, catching up to the woman with the blond ponytail a few miles down the trail. I pass her. She passes me back later, looking invincible. I catch back up, and we run together for a while, along a sandy wash that seems to go on forever. We commiserate. We catch up to another runner, who joins us. Then, my stomach is beginning to rebel. Maybe nothing but 50 or so Swedish Fish were not the best fueling option? I take some ginger. It doesn’t help. I slow down, telling my competitive instinct to shut up. The blond ponytail, still looking super strong, and probably smarter about her nutrition than I was, moves further and further ahead until she’s out of sight. Good for her. At the next aid station, I look past the candy. Instead, I chew a small piece of bacon, then swig some fizzy coke – a strange combination that sometimes works. My stomach quits lurching. I open a Stinger waffle that’s been sitting in my pack and nibble on it. Energy flows back into my tired legs. Ten miles left to go. 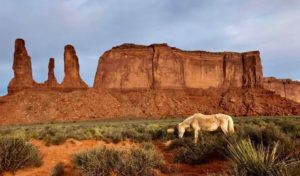 A Navajo man on a beautiful horse named Mustang points me in the right direction. My competitive instinct pipes up again. I’ve been running with two guys named Joe and Mike for the last few miles, but now leave them behind. Time to see what’s left in this old body. I pass a woman I have not seen before, but no trace of my nemesis with the blond ponytail. 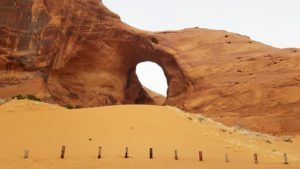 The giant sand dune at mile 45. It looks a lot more intimidating in person. Last year, we ran this part of the course in the opposite direction. 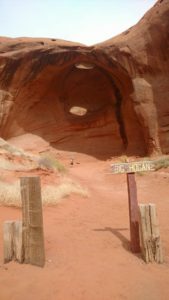 I remember sliding down a giant sand dune somewhere near Brigham’s Tomb. Sure enough, there it is, only we have to climb up this monster today. Time to dig deep, to keep putting one foot in front of the other. An eternity later, I reach the top. Dark clouds gather over the Mittens in the distance. The wind picks up. The air crackles. I smell rain. I also smell the irresistible aroma of the finish line. I’m in beast mode, filled with energy. 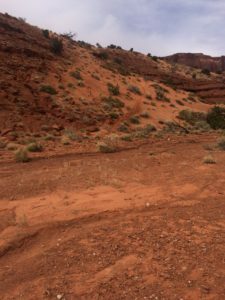 My tired legs can still move, so I keep moving, past a runner in a red shirt, up and down the sandy hills, into the afternoon sky that’s almost black by now. Two more miles, maybe. A familiar silhouette with a blond ponytail comes into view. She is still running strong, but I feel stronger. My competitive instinct roars. I fly past, blazing down the narrow trail without looking back. Do I have what it takes? There’s no time to wonder. My legs manage a last burst of speed. The trail becomes a dirt road. The finish line is within view, but still not close. I dig deep, imagining the blond ponytail breathing down my neck. Finally, cars, people, tents. One more uphill. I resist the urge to look over my shoulder. I sprint across the timing mat. Finished. It’s done. What a race! What a day! David is waiting for me, with a hug and his camera. I feel utterly spent, happy, proud, alive. And I later find out I have placed second female in 9:00 hours. The face of exhaustion. I left every ounce of energy out on that course. As soon as I stop moving, I start to shiver in my T-shirt and running skirt, noticing that everyone else has bundled up in winter jackets. The tents are billowing like sails in a hurricane. I usually enjoy hanging around the finish line, soaking up the positive vibes. Today, it’s too cold, and I’m too depleted to get warm again. It’s been a perfect day otherwise. 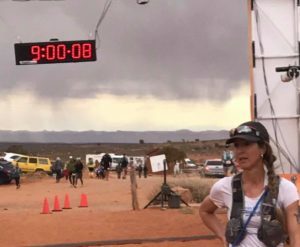 My one regret is that, because I was shivering so badly, I missed congratulating Angie, the amazing runner with the blond ponytail, who reached the finish line two minutes behind me. Angie, I hope you find my blog. Thank you for a great race. You pushed me to my limits. Why I did not hang around the finish line. 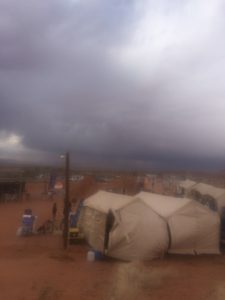 The tents did not blow away, but they came close. And thank you, Quang, Joe, Pam, Mike, Allen, Leslie, and all my other runner friends who shared part of this beautiful race day and made it memorable. Thank you, David, for running your heart out in the 50k, for being the world’s best possible partner, and for taking such beautiful photos. It means a lot. 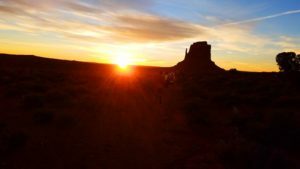 Most of all, thank you, Navajo Nation, for sharing your sacred desert with us runners. This place made me strong again. I have won the battle with the evil virus. 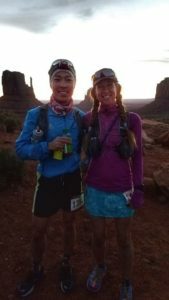 Monument Valley is so much more than a race. It’s a life-changing experience. It’s a healing ceremony. It’s a celebration. I now feel ready to tackle the world. This entry was posted in Uncategorized on April 3, 2017 by silvakat. Thanks for an amazing race report. This looks just gorgeous. There is nothing better than feeling renewed by nature. Thanks, Amy. Consider running it next year – it’s the best! Glad you are healed. See you at Cedro. Thanks Mary Ann. We just signed up! What oh what are Swedish fish and stinger waffles? Haha! I’m glad you asked. 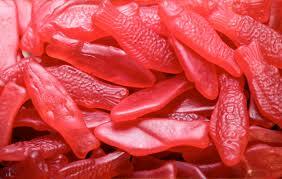 Swedish Fish are those red gummy candies in the photo. They’re made of corn syrup, gelatin (i.e. hooves – gross!) and carcinogenic artificial color. I used to live on giant bags of them while at horse shows. Now, I try to eat healthier things, except while running ultras. Stinger waffles are in a different category: a delicious, organic treat and great ultra fuel. I’ll bring a couple next time I see you.